Wednesday April 3 1907 Will went to Cedar Rapids at 7.20 and did not get home till 6.37. I worked out of doors all day I got quite a lot of things done. Went to bed early. This has been Brother Robs birth-day. Thursday April 4 1907 Will went to Cedar Rapids again today. I had Billy help me some in the morning. I worked out of doors most of the day. I set 7 more hens. Will did not get home till 7.30 tonight. 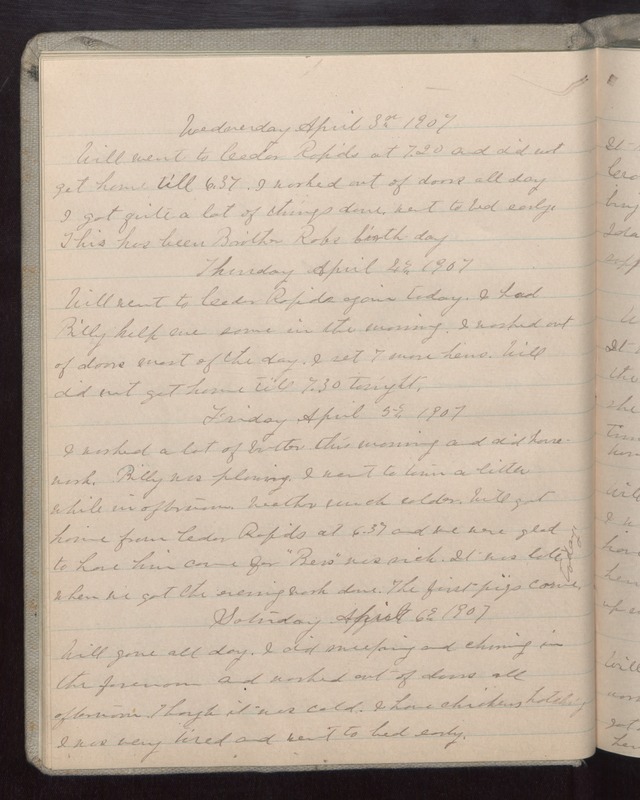 Friday April 5 1907 I worked a lot of butter this morning and did house work. Billy was plowing. I went to town a little while in afternoon. Weather much colder. Will got home from Cedar Rapids at 6.37 and we were glad to have him come for "Bess" was sick. It was late when we got the evening work done. The first pigs came today. Saturday April 6 1907 Will gone all day. I did sweeping and churning in the forenoon and worked out of doors all afternoon. Though it was cold. I have chickens hatching. I was very tired and went to bed early.